FREEZER: Completely cool leftover muffins. Place cool muffins on baking sheet. Freeze for 2 hours. Remove and place in gallon freezer bag and return to the freezer. To reheat, microwave frozen muffin 15-20 seconds, until warm. Or, preheat oven to 300°. Spray a muffin tin with oil, put frozen muffin in tin and bake for 10-15 minutes, until warmed. sea salt and fresh cracked black pepper for topping. *One note about using paper cupcake liners with these muffins! When warm, the muffins will stick to the paper. When muffins are room temperature, the papers will come out of the papers easily. To avoid this nonsense, just grease and flour a muffin tin instead of using cupcake liners. Place a rack in the upper third of the oven and preheat oven to 375 degrees F. Grease and flour a 12 cup muffin tin and set aside. In a medium bowl, whisk together flour, baking powder, sugar, and salt. Set aside. Divide batter between prepared muffin tins. 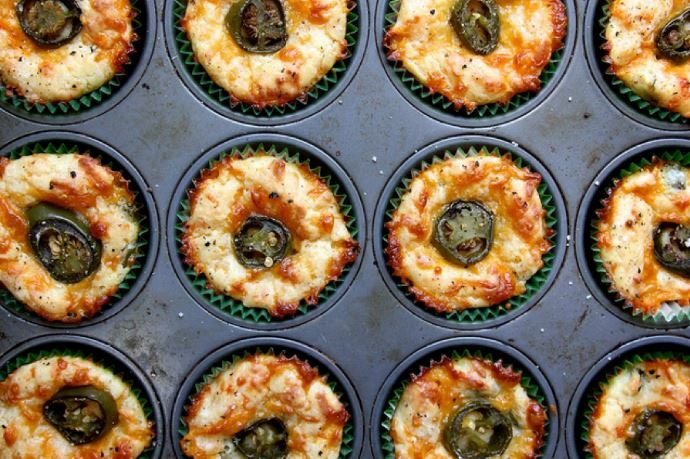 Top each with a jalapeno round and sprinkle with sea salt and cracked pepper.